2. Working Hard But Not Making Enough Progress? 3. Ever Regretted NOT Speaking Up? 4. Tired of NOT Being Heard? Description: http://www.sherylkline.com/blog I am so excited! I spent all day at the Women in Cloud Summit 2019 at Microsoft, learning from over 1,000 of the country’s top technologists and tech entrepreneurs and doing a book signing for ZONED IN. Let’s talk about a couple of the things from the book that resonated most with these amazing women and which are important to all of us. 1). The importance of long-term clarity: Not just your one-year goal, but your five-year goals. This has less to do with what tasks will you accomplish and more to do with how you want to be remembered or what legacy you want to create. Once this is dialed in (It can be hard to do, but there is a process to figure it out! ), you have the platform to create the reality for yourself, your team or for you family. 2). Discovering how you want to feel in your days: I shared tips, tools and habits how to take control of work-life balance, how to slow down your days (Yes.. this IS possible!) and how to feel happy and satisfied at the end of your day as well as determining how you want to feel in the future. Once you have the blueprint, you can build the house! 3). Learning how to use your voice to speak up: ... even when you’re scared or unsure. I heard from some of these amazing men and women, that it's sometimes hard to have the courage to speak up either professionally or personally. I shared how men and women can gain the courage and prepare to speak up, especially in the moments when you're feeling like it would be safer or easier not to. Whether in the boardroom, classroom or living room, I really want to challenge you to start thinking about these three things. A lot of times, we are clear on our tasks, but not on how we want to feel or the legacy we want to leave. Finally, we tend to put off the tough conversations (I’m guilty too!) that have the potential for the most growth. If you want to uncover your next level of ambition or want to get dialed into what you want your legacy to be, I'm going to be dropping some really powerful nuggets over the next couple of weeks on how to get that done. Some of the same things that I was talking to these women and men at this recent amazing event. 10. Are You At An Ambition Checkpoint? Description: I had a conversation with one of my oldest and dearest friends recently that at first struck me as odd. She asked, "Do you ever feel like a plastic bag, drifting through the wind wanting to start again...?" I recognized that was the opening lyrics to Katy Perry’s song Firework. She was off. Not her present, fun, happy, and courageous self. It was strange, because she’s so accomplished. She had raised happy, productive, and conscientious kids. She worked doing what she loved. She had a few half-marathons under her belt, and she had a loving family and friends. After many conversations, I finally understood. She was at an ambition checkpoint. Her kids needed her less, and she felt like there was more of her to give to her career. More people to serve and a legacy to create. It was inaction that made her feel she was off-purpose... like a plastic bag drifting through the wind. She was being blown around by her days, by her old routine, by other people’s wants and needs, and by being "busy" without being clear about what she wanted. Without defining her next level of ambition and having a plan to make progress. She knew there was more. More of a sense of contribution. More of a feeling of purpose. More joy. If you are at an ambition checkpoint, here are a couple tips to help you develop the mindset to check in, and check out of being stuck there any longer: 1. Have Gratitude Experience gratitude for what you have already accomplished, the lives you’ve touched and the progress you have already made. You’re a climber, and sometimes it’s easy to forget how far we’ve come. Trust me. I’m guilty too! 2. Create Space Reflect about what is missing, what it important to you, and what would make you most happy and proud if it were a year from now. Go to your favorite coffee shop, take the day off, or go somewhere that inspires you. This is a priceless gift you can give yourself. 3. Develop Your Roadmap Consider the steps needed to get to where you want to go. It’s common for world-class performers to start with the end in mind and work backwards. They envision the finish line, what they yearn for first and think about it often in visceral detail. Once you draw up the plans for your dream, it’s time to start building it. Once you do this, you are off to the races! See, we have a human drive to feel like we are living as our best selves. When we aren’t, we get the tap on the shoulder to pay attention and next-level our efforts. Maybe you are crushing it at work, but your relationships are suffering. Maybe you are giving 100% to your family, but you’ve put aside your dreams and aspirations to serve others. Or possibly each bucket is half-full, but you’re too comfortable and are bored. We can ignore the tap on the shoulder, but it rarely retreats. There is usually a price to be paid for neglecting it for too long. Please do not hesitate to reach out to me. I am here to help make this content real and help any way I can. Description: Is it possible that you have everything it takes to achieve what you yearn for and what, I believe, is already rightfully yours? Maybe the reason why you have not achieved the level of success you want and deserve is because of the limitations you place on yourself. I know that was the case for me up until three years ago. How could I go from having a thriving yet (very) small private practice to helping thousands? To help the masses refine their clarity and gain the mindset required to reach their potential, to arrive at their Olympics? Who would listen to me and find value in what I had to say at Fortune 500 companies in San Francisco, Silicon Valley and globally? I consider myself as a relatively smart person, but that was sure stupid thinking. Companies like Google Ventures, Autodesk, CapitalOne, Bank of America, and VMware (to name a few) have listened the last couple of years. Up next, a national podcast tour for my upcoming book, "ZONED IN: The Mental Toughness Required for a World-Class YOU" and major speaking engagements in 2019. It’s to share with you because, as I started believing in myself three years ago, I believe in you. I care so deeply about your success, and your joy. Also, I will not allow stupid thinking to get in the way of your next big win. Here are a couple possible results when smart people think stupid and how you can avoid this trap: Example #1 Not so productive: I failed at ___________, so I must be bad at ______________. Much better: I failed at ___________, so I must have had a poor performance that day. Example #2 Not so productive: I have never achieved this _____________, so I maybe I never will. Much better: I have never achieved this _____________, but I believe in my ability to improve. Let’s take a look into the science behind the consequences of stupid thinking. Dr. Albert Ellis is considered one of the most influential characters in the history of psychology (for more information on Dr. Ellis, have a look at the Albert Ellis Institute, http://albertellis.org). His life’s work was centered around curing depressive disorders, but we can learn an important lesson about not just going from sick to well, but how to go from good to great. Ellis proved that when we stop thinking wrong (i.e. : in a highly negative and propagandistic way) and start thinking right (i.e. : in a more encouraging and optimistic way), we can be cured of many types of depression. I am not qualified, nor do I diagnose or treat depression, but in the context of performance, imagine what we can accomplish if we started raising our ambitions ... and if we started thinking about what’s possible rather than the obstacles in our way or our past failures? Maybe we’ll "cure" failure or quitting and discover a remedy for our biggest success yet. Description: "Non-negative thinking sets the best apart from the rest." If you're human, you will experience failure. Period. Serena Williams experienced a huge failure in the Miami Open a couple months ago, an early exit in round 1. Unheard of, right? Not really. She was a new mother, not back in her best shape, and it was her first tournament since the birth of her daughter. We fail too. Maybe we lose a competition, a prospect says no, a presentation goes south, or we get rejected after a promising (so we thought) interview. According to Dr. Martin E.P. Seligman, founding father of the new science of positive psychology, there is a power in positive thinking, but it "pales in comparison," says Seligman "to the importance of what we think after we fail." Our “non-negative” thinking sets the best apart from the rest. Serena, packed up after the Miami Open, understood that she did not in fact fail. She needed more time to prepare. She was optimistic about her ability to come back, and vowed to do what it takes to make progress. It’s time to take to take inventory of what Seligman calls your “explanatory style,” how you explain defeat to yourself. Do you concede that you are "not good enough,""not capable" or "not deserving?" If so, you may have what Seligman calls a "pessimistic explanatory style" which is not going to serve your long-term success. If your explanatory style is more optimistic, you feel setbacks are temporary, and a way of learning how to get better, you should recover from setbacks quicker and make more progress over the long haul. Here are a couple tips for what to say to yourself when you fail: "This was an isolated incident, and doesn’t mean I am not smart/capable/deserving/competent enough. ""It’s ok if I’m upset/disappointed/frustrated for a short period of time, but I am committed to learning and improving." (i.e. : being resilient) "This setback has nothing to do with other aspects of my life. Just because I failed/had a setback with work has nothing to do with my ability to be a good partner, friend, colleague." Bottom line: If you work on having an optimistic explanatory style, you will be more resilient, make more progress, and very likely, be happier. There are also other benefits according to Seligman, such as boosting your immune system as well. Chin up. You got this! ... and I am here to support you every step along the way. Description: http://www.sherylkline.com/blog Have you ever been told that you will never improve, or you are not a good fit? After the London 2012 Olympics, Mariya Koroleva thought she would be in serious consideration for the next Olympic team in 2016, but she was not. Mariya was told she was too old (at 23) and that she did not fit into the team that was being considered which would be much younger. She had a choice: 1. Give up on a second Olympics 2. Go for it and train for another year with no guarantees of being placed on the team. Mariya went for it. She felt in her gut that the world had not seen the best of her, and she had not seen the best of herself. Mariya did not want to have any regrets. She’d commit to being "all in" for that year before the decision for the next Olympic team was made. Mariya felt that if she gave 100% and still did not make it, then she could be at peace that she gave her best. We all have our own Olympics, and sometimes we need to trust our gut. Here are a few tips to help you take a leap of faith: Give yourself the gift of time and space to realize the best decision for you. When we are too busy and/or stressed, we are not setting ourselves up to make a good decision or to realize the answer that we may already know. Believe down to your soul that your desired result is possible, and start seeing yourself at the finish line. I recommend saying (out loud) an "I am" affirmation every night before bed and then being as detailed as possible thinking about how it feels. Take control of your progress. What will you do this week to start moving forward? Description: I saw Serena Williams play an exhibition match in Los Angeles when she was only 11 or 12 years old. Looking back, I wonder if she realized that she would be the named best player in the open era and have earned more than 22 Grand Slam titles! Not to mention all of her other unimaginably successful endorsements and businesses. Maybe not down to those exact details, but she did work every day believing her day would come, and believing it was possible. It’s that unwavering belief in ourselves that allows us to dream big and persevere. When it comes to our long-term objectives it’s important that we “proceed as if success is inevitable” (my favorite quote, BTW), hold on to our dream, and then relinquish control of the outcome. You, like Serena Williams early in her career, have little to no control of the scale of your future success. There are many unknowns: What will the competition be like? What setbacks will you have? What obstacles will get in your way? Will you be good enough? When we dream BIG, we must assume our desired result will happen, and then let the worry and doubt surrounding the outcome go. Proceed every day as if your success is inevitable. If we attach our daily efforts to our own personal Olympics, the chasm is too great to cross. We get discouraged, risk getting injured or worse, we quit. Let’s say Serena Williams wanted to be #1 in the world when she was 12 years old. But she lost consecutively that year, and suffered an injury at this time as well. On top of that, maybe the naysayers were prolific since her father was a coach and she did not play traditional junior tournaments. Injury, losses, and negativity could be a lot to bear for Serena Williams, and could definitely take its toll on motivation and progress. So what keeps US in the game and fighting past setbacks, defeats, and those who intentionally or unintentionally, discourage us? We must believe our dream is possible, and then let it go. One of the main characteristics of long-term objectives is that we have little to no control. When a young person wants to win a gold medal in the Olympics (let’s say in a decade or so), she has little or no control whether or not she will make it to the Olympics… nonetheless win a gold medal. She believes and practices every day like it’s possible. She sees herself on the podium, receiving the gold medal. She feels the width of the ribbon around the back of her neck as she bows to receive it and also feels how heavy it is as it hangs around her neck. She hears her National Anthem, feels her hand on her heart with tears of joy in her eyes. She holds her congratulatory bouquet over her head, waving at all the fans holding her country’s flag, finally catching sight of her parents in the stands who are jumping up and down screaming, so proud and filled with love and joy. It’s time to start seeing ourselves today as we want to be in the future. What is it like once you’ve arrived? How does it feel? Who is there to celebrate with you? Create victory in your mind and visit it as often and as heartfelt as you’d visit a friend in need. However, in your day-to-day activities, focus on what you have control over to make progress and let the outcome go. By taking control of your actions, you’ll gain confidence in those small successes which in the long run add up to a big victory and more confidence in your ability to succeed. I am here to make this content real and to help you devise a plan to achieve what matters most to you. Get (and Stay) Engaged: Here are the four best ways I can help you, and for you to join our community: Join us on Facebook: www.facebook.com/mentaltoughnesscoach Grab my FREE "Confidence Accelerator Video/Podcast" series Work with my team and me privately 1:1 or in a small group. Step 1: apply for a FREE 1-hour Discovery Session Let's chat (schedule a FREE 15-minute consult call with me) Here's to you being amazing! Description: Sometimes our dreams and aspirations are a little mismatched with our efforts. Full transparency... I was called out on this one by my mentor this past January. Don’t get me wrong I was working hard and extremely busy. There was something missing when it came to how I was approaching my next level of success. I had next-leveled my ambitions, but how I spent my time was the same. My ambitions were not aligned with the next level of success I wanted (and knew I deserved.) This worked for a while, but the next level would require me to "go pro." Once I made the necessary adjustments and fine-tuned some key habits, that’s when the next level was attainable. We’ve talked about where you fall on the ladder. But what are your current circumstances now, and what level of commitment are you willing to have? Pro: You are actively taking action to become the person you want to be, and you are remarkably consistent. Proficient: Maybe you are consistent, but you must take your habits and your actions to the next level to get what you want and deserve. Novice: Maybe you are a novice, meaning you want and deserve something, but consistency is not your friend. Quitter: Maybe you gave up for now. But you realize it’s your time to get started or restarted. If it’s your time to "go pro," here are a couple questions that should help you make the shift so you can see the progress, and joy you want and deserve: Assess your current ambitions and your actions, and then ask "what needs to change?" Do you need to ask for help? Do you need to learn a new skill/become more proficient in something? What changes will you make and by when? I am here to make this content real and to help you devise a plan to "go pro" at what matters most to you. 18. 3 Best-Kept Secrets to Win the Day... Consistently! Description: Have you ever tried to cut sugar out of your diet, but the pantry is full of sugary treats? I have, and it usually ends in failure, frustration and disappointment:(. Now, the pantry is filled with foods that support my desire to be more fit and have more energy. We all have so many good intentions and so much as well as good in us to create and to give. We must give ourselves a fighting chance to achieve what we want and deserve. Not just for us, but also for those who matter most to us. Here’s one world-class secret to help you "win the day" consistently which can pay mass dividends over the long haul… Create an environment for your success. In the video, I mention going to Sonoma every Monday to write my book and clearing off my desk completely when is time to write. Take it a step further, I write off-line in Word and disable my internet connection. When at home, all workout clothes get laid out the night before, water bottle filled up, morning shake made. This sets me up for an active, healthy and low stress way to start the day. Whether it’s eating more clean, writing a book, or organizing your office, it’s time to set your environment up for success, so you can have the progress you want and deserve! 19. 3 Tips to Nail Your Next "Big Win"
Description: Do you ever feel purposeless? We know finding clarity and purpose is difficult, so we're approaching it from a different angle today: how you can develop the courageous mindset you need to develop purpose, because we believe that anyone can have world-class purpose. Geoff Woods, Vice President of "The ONE Thing" podcast interviews Sheryl Kine. In this podcast episode you'll learn: -- What creates the gap between high achievers and everyone else. -- How you can use positive affirmation to develop a more purposeful mindset. -- Why you need to practice being purposeful (and how to practice deliberately). -- Why you need to align yourself with an expert and put an accountability structure in place. -- How you can commit to progress (instead of perfection). Description: Growing up, no one told me that life can be hard sometimes. Raising kids, growing a business, running a marathon, and contributing to the community can be incredibly rewarding. And hard. We can learn a lot from world-class performers. They dream big, do small often and consistently, and they fail (a lot). Are Olympians, accomplished musicians, senior leaders, and those who are starting movements to make the world a better place equipped with super powers, an abnormally high IQ (well, some are but not a prerequisite) or an extra "success" chromosome? According to Angela Duckworth, the author of Grit: The Power of Passion and Perseverance, the answer is "no." In order to be world-class at what’s most important to us, we must commit to attempting what’s hard for us. We must be intentional about pushing ourselves to do things that are difficult and then stick with it for a specific amount of time. If you want to get better at something that’s important to you, choose a difficult goal (and get busy :). Here are a couple ways to get started: Ask Yourself What Is Important and Why? It’s important to choose something difficult and that you connect it to a high level of purpose. For example, "I want to help 10,000 women to be Mentally Tough. I feel their highest contribution to themselves, their families, their companies and to the world as well as their personal happiness, depend on them having a world-class mindset." Get Accountable. Find someone who is more knowledgeable than yourself to learn from. This has been proven by Dr. Anders Ericsson, author of Peak: Secrets from the New Science of Expertise. We must learn from an expert who will push us outside our comfort zone and then be willing to try and try again. Celebrate the Wins and Neutralize the Setbacks. It’s important to surround big and small wins with lots of emotion, especially when attempting something difficult. As for the setbacks, and there will be setbacks with high ambitions, be sure to process them in a logical and matter of fact way. For example, "I’ve been ignored by Oracle for months (purely hypothetical:) which is a setback for my goal of helping 10,000 women to be mentally tough. ""That’s frustrating, but I accept the frustration and will keep following up. ""I crushed VMware last week and continue to transform lives from the in-person and global attendees there. I choose to celebrate that!" So, run farther, jump higher, try a different hobby, or go for something at work that you think is beyond your reach. You are only limited by what you think is possible, and others will cheer you on and follow your lead to next-level something that matters; even if it’s hard. Description: Whether you consider yourself a world-class performer or not, you have a lot in common with those among the elite either professionally, academically or athletically. You may sometimes fall off your purpose or lose it entirely. ‘Is this really what I am meant to do in the long-term?’ ‘What is my purpose or the best way for me to make progress today?’ ‘I need to switch gears , so how do find my (new) purpose?’ Athletes retire or get injured, senior leaders switch careers, academics change fields of interest, so they are not immune either! Lacking clarity on purpose can feel like the middle place, and it doesn’t tend to be too comfortable (at least not in my experience). Partly because we are not making progress towards something where we are making an impact for ourselves and/or for others. The good news is that we can learn from what world-class performers do a little differently to be more purposeful, so we can move towards being world-class at what’s important to us. Here are a couple of tips to get started: Believe purpose is possible. Sounds simple and like a no brainer, right? Not so fast! When we are not confident that something is possible, we tend to have very narrow focus. For example, if you are frustrated and tell yourself over and over again that purpose (short or long-term) is not possible or unlikely, you will have on blinders to the things that light you up or the things that are meaningful. Negative Self-Talk (a topic for another day!) is like practicing something over and over again in your head that that re. Think of it as walking through a beautiful field with a frown on your face, looking down at your shoes. You miss all the beautiful flowers! Consider this. On May 6, 1954 Roger Bannister ran the first sub-four minute mile when no one thought it was possible. Just 46 days later, Mr. Bannister’s record was broken. Once he ran a sub-four minute mile, others started to believe they could do the same. They did. Start to believe in your ability to find and live into your purpose which will help you to be aware of the possibilities. Others have and you can too. Here are a few tips to get you started. Slow down. If you don’t, you are avoiding putting in the work. Do Olympians win gold medals without putting in the time? Of course not. If you want to live more purposefully, you must put in the work too, and that means creating the time to be still, reflect or the time to possibly try new things or gather information. In our busy lives, we must ask, ‘What is most important to me right now and why?’ If becoming more purposeful tops the list, start scheduling time with yourself for this very endeavour or with other people who have what you want. Get intentional. Now that we believe becoming more purposeful is possible, we have created the space to allow for progress, we must get intentional about going after it. That means we create a daily or weekly routine to make progress. Here’s an example: ‘I want to grow my business, but I am not an experienced business owner. I lack purpose on my daily activities, so I will meet with a business coach once a week or with a mentor.’ Maybe you have no idea what your purpose is (You are not alone btw. ), so you may set an intention to try something new once a month or meet up with someone who is passionate about what they do. The more detailed the better. What, when, who and what level of presence will you have? Bring your ‘A’ game! I consider all of you world-class performers who can next level your ability to be more purposeful. It’s more than that actually, we all must next level our sense of purpose. The world needs you to be as amazing as possible, especially now. Mental Toughness is the tool belt or catalyst which helps you to make consistent progress and to be happy along the way. Please check out the library of (free) resources on my website (SherylKline.com) or schedule an appointment with me if you’d like to learn more! Here's to you being amazing! Description: Have you ever had a week where the sh%@t hits the fan? If so, you are most definitely not alone. Here’s a world-class tip on how to best get through it. This tip will also help make those normal but busy days feel a bit more relaxed, in control and rewarding! One habit that world-class performers have that you can learn too is: develop clear boundaries. For me, #1 is that I need to get sleep. No sleep means I’m not able to be my best. I can’t serve my 1:1 clients, monthly subscription-based clients or deliver in my corporate workshops and trainings. Full transparency, I am not that fun to be around either (or so I’ve been told :). I set clear boundaries around when I shutdown screens (8:30 pm on weekdays) and when I start my evening ritual (chamomile tea, ice water, meditation). There are exceptions to the rule, but not often. When it does happen, I take a nap during the day, even for 15-20 minutes. Another example of a boundary is when I schedule a one hour lunch-time break to walk, read, eat and meditate (even for 5 minutes!) I may have lunch with a friend, but no work, errands, etc. What do you NEED to be your best self throughout the day, and how do you protect it? Here are a couple tips to help you to be world-class at what’s important to you by setting boundaries and taking a little control of your day: Plan out what boundaries you will need to set to accommodate your new ambitions: Whether it’s planning out an important conversation, planning how to accelerate your progress on an important project, or planning your new workout routine, planning is key. Commit and don’t feel bad about it: Do you want to eat cleaner? Want to get more fit? Always wanted to write a book? Set some boundaries, so you can do it! You will be happier and be a better friend, colleague, and family member for it. Unless your goals and dreams would put a severe hardship on someone else, the time is now. World-class performers are conscientious but determined, and you can be too. Fill in the crew: Let those around you know your new routine, why it’s important to you, and that you would be incredibly appreciative if your request was respected. For example, you want to go to bed at 9:30 pm, so you can work out in the morning. If anyone depends on you at home, you will gladly help them before that time. Do you want to go for a walk, read or meditate during lunch, so you can get recharged? Invite your crew along or let them know that you want to spend time with them ... but you need an hour to yourself during lunch. Boundaries help you take control of your day, so it doesn’t control you. We have all had those days where we gave up on what’s important to us, and gave into others requests that could have been delegated or deferred. Again, we want to be conscientious but determined, so we can be world-class at what’s important to us. I am here to support you and to make this content real. Here’s to you being amazing! Description: It’s very common for us to judge ourselves based on other people's sizzle reels rather than what's real. We don't see the struggle, insecurities and messiness of others. Rest assured, it's there at any level whether an amateur athlete or Olympian, whether an intern or CEO, or whether a new mother or the household CEO of 4 teens. So, how do we focus on progress not perfection to be world-class at what's most important to us? Today we are going to focus on one thing you can do to get started: Practice saying Affirmations daily. Consider that we become what we constantly tell ourselves. Evidence-based research shows that affirmations, actually change the brain on a cellular level—in other words, what you think about matters—a lot. “Thoughts have a direct connection to your health.” says Dr. Joseph Dispenza, author of Physics, the Brain and Your Reality. Here are a couple tips for you to use Affirmations to be world-class at what's most important to you: 1.Develop a ‘can-do’ attitude. Sometimes we have to be actors or actresses! Maybe it’s unlikely a goal will happen or uncertain if you will perform at a level that you hope for. Even so, it’s important to believe you can reach your biggest dream or achieve rockstar status when it really matters. Why? You will become more aware of what it takes to get there, you’ll be more confident, more motivated, AND less distracted. Keep affirmations positive and encouraging. You got this! As Amy Cuddy, a Harvard Psychologist and TED speaker says, ‘Fake it until you become it.’ 2.Keep it positive. When you repeat affirmations to yourself (‘I am smart enough to reach my biggest dream.’ or ‘I am only limited by what I think is possible.’), positivity is more than just making you feel good. It will help you believe you are capable, or raise your self-efficacy, and that’s can be a huge motivator and cheerleader especially when if it gets difficult or if you suffer a setback. 3.Check out ThinkUp(™). I’ve had the pleasure of working with Irit Wald, CEO/Founder of the positive affirmations app, ThinkUp. Essentially, ThinkUp combines positive affirmations with your own voice and with music to change the way we think which helps us DO differently too. You can try ThinkUp here: https://itunes.apple.com/app/apple-st.... There is a paid and free version. Try creating and listening to these every night before bed for 10 minutes. What change or transformation do you want to see? Remember to dream big and do small. Positive affirmations are a great way to start. You have it within you to be amazing, and it starts with believing you can! Description: We all face the threat of someone or something disrupting our status quo. The mere thought of disruption can be paralyzing or it can be a secret weapon. With the proper mindset and tools, you (or your team) can take control to use disruption as a superpower. I had the opportunity to catch up with Michael Alf of the Disciplined Disruption Podcast. Here are a few of Michael’s rules to be proactive surrounding disruption, so you can capitalize on an uncertain situation. In future episodes, I will talk about the mindset and planning required to execute these amazing tips: Developing the proper mindset is a vital component when it comes to planning for disruption. One of the biggest challenges as businesses, industries and roles are changing is: ‘How do I expand my tool belt to be as prepared as possible?’ The answer to this question starts with being confident in what’s possible and having the mindset to make clear and actionable progress even when it gets challenging. Becoming more agile is key, within an industry as well as becoming personally more agile. Women especially in traditionally male industries, need to have a heightened awareness of how to deal with disruption in an organization and have a structure in place to do so. Networking and taking control can make a huge difference in the end game, and the planning should start sooner rather than later. Specifically, networking groups should be inclusive of men and women and not limited to one gender group. If women, do not have an inclusive networking group, one should be formed. Women can step into and take control of this process for the best outcome for themselves and their male colleagues. I encourage you to reach out to me, so you can gain clarity and get a plan in place for you to use disruption as a superpower. Let's talk, because putting a pen to paper is where the transformation takes place! I am here to support you and to make this content real. Here’s to you being amazing! 32. Motivation Mondays: You Need to Go For Things That Are Important to YOU! Description: It’s not just about the "10,000 hour rule" and putting in a lot of time. It’s about HOW you practice (deliberate). Find an expert/coach to help you out... push yourself beyond the limits that are comfortable… it’s your time to get going NOW! You can be at a level that’s world-class for YOU! You’re good enough. You’re smart enough. You’re athletic enough. Dream big and do small. It’s just has to do with your MINDSET and HOW you practice. Description: I’m going to address the “F” word right away so I don’t get in trouble. The “F” word is “Fear.” Emotions can propel us to greatness, or they can paralyze us, bringing creativity, productivity and motivation to a screeching halt. I sure prefer the later for moments that really matter and for long-term ambitions. Let’s talk about the Emotional Wheel and “F”ear, as well as how your mindset may affect how you plan and how you perform under pressure. The good news is that you can learn the tools to dream big, do small and crush it especially when it matters. Zone performance is not just for the elite few, it’s for you too! Green light means that you likely have a deep awareness and understanding of what emotions you experience, which ones serve you, which ones don’t as well as how to manage your emotions for optimal performance and optimal long-term thinking. Yellow light means caution. You may not be as aware of your emotions and how to regulate them. You can recover and get back to zone performance from here, but it may be challenging. There can also be consequences when it comes to creativity, productivity and motivation if recovery is not set into motion quickly. Red means it is unlikely you will be able to recover back to zone performance without a significant break or stopping what you’re doing all together. This is where the ‘downward spiral’, limiting beliefs (‘Maybe my goal is too lofty.) and learned helplessness (‘Maybe I am not good enough.) live. Creativity, productivity and motivation are infrequent visitors here. Whether it’s for moments that matter or whether for planning your long-term ambitions, your mindset and how you deal with fear matters. Keep in mind that world-class athletes are human just like us, and they feel all types of emotions including negative ones. The difference is that they know how to manage them and even use them to get back into ‘zone’ performance and into ‘zone’ future planning, sooner rather than later. You can learn how to get back into the zone too. It starts with being aware of your emotions and aware of where you want to be, especially in moments that matter most. Description: We all face the threat of someone or something disrupting our status quo. The mere thought of disruption can be paralyzing or it can be a secret weapon. It’s all in your mindset and what you choose to do with it. Here’s one tip to "Leverage Mental Toughness to Rock Disruption" so you can get aggressive today about planning how to rise above the rest tomorrow: Keep this in mind, and you’ll be on your way to using a tool you already have in a way that most people don’t know about. Here’s how: Use fear to drive progress. In order to foster creativity, productivity and courage it’s important to use this emotion to your benefit rather than to your detriment. Fear can be paralyzing or it can be a super power. It depends on your mindset, how you perceive it. Here’s how to take the first step: 1.) Recognize a potential threat and its consequences. 2.) Release that fear by accepting it, and then thinking of it as an ally. 3.) Strategize by using your fear to raise your sense of urgency to think of the most impactful ways to be innovative today for your best performance tomorrow. Think of it this way. If you were training for a race and wanted to become faster to qualify for an event. A potential threat could be an injury. You could choose to get conservative with your training to "stay healthy", or you could use this fear of injury to get aggressive about the latest techniques for flexibility and joint support. The fear of injury is very real, but it’s what you do with it that matters. Do you perceive it as potentially derailing all your hard work, or do you ask it to walk beside you to get even more dialed on preventative care? Fear is a powerful emotion. It’s up to you what you do with it. Description: Forming new habits take time (Dr. Phillippa Lally's famous study out of the University College London noted on average, it takes 66 days before a new behavior becomes automatic). But, the awesome thing is that when you can form new habits, that's how people really become experts and actually happier. They're getting the things done that are important to them. Once they form a habit, then they can move on to something else to get even better. Whether it's for exercise or it's for doing something at work and forming a new productivity habit, it's super important. I have “partner in crime” who is incredibly important to me in forming new habits and also in being accountable. Kona is a 3 year-old American Labrador Retriever, and she is my accountability partner to go running four days a week. I don't want to say she's annoying. Let's just say that she's persistent. Whether it's for exercise or it's for something at work (for example you need to practice for a big presentation coming up in a few weeks) it’s super important to have an accountability partner. There's a couple different types of accountability. The best one I find is to have someone physically do something with you. In relation to Kona, she is my accountability partner because she's very persistent and she will not let my day go on until we go for a run. As my accountability partner, Kona and I dthe running together. Another way that you can be accountable to form new habits is to verbalize to someone. Back to our earlier example of the big presentation, let’s say you must practice for a presentation 15 minutes a day. You can either… A) have your accountability partner come with you and practice with them (which is ideal) or B) if you can't do that, you can put your accountability partner on notice and say, "Hey, I have this big presentation coming up and it’s very important. I need to practice 15 minutes a day and I'm just going to call you in the morning and let you know when I'm going to start doing this." Have someone help you out that way. A third way that you can be accountable is to yourself. That would be to write it down. You might jot on a piece of paper (again, if it's for work) “I'm going to begin practicing for my big presentation each day at 9:00am until 9:15am. It’s not only important for you to write that down once, you should do it every day and put it somewhere where you can see it. Forming new habits can empower you to become an expert quicker and be happier. I venture to say that because when we’re getting things done and we're accountable, we naturally become more proficient, we tend to be more happy. That is really important too. The one secret today for you to form new habits quicker is to get accountable: 1. Be accountable with someone and to physically do what you're going to do with them … and/or 2. Verbalize it to someone and do that every day until it becomes a habit … and/or 3. Be accountable to yourself by writing something down and viewing it every day. Description: You work extremely hard to prepare for high-pressure or competitive situations, and it’s incredibly frustrating when results do not measure up to your effort. There is one thing you can do to help boost confidence and encourage your best when it matters: Set Intentions. Here’s how: Intentions are things that you can or will do empower you to focus (that’s a bonus!) and believe in yourself. This increases your self-efficacy (your belief about your capability to produce designated levels of performance that exercise influence over events that affect your life.) For example, “At 4:00-4:30 p.m. today I will spend 30 minutes compiling research for a presentation.” So, the outcome of the presentation is uncertain, but there is certainty surrounding your preparation and execution. Why it works. Setting Intentions gives you control over what’s important to being able to do your best. It’s also an internal accountability system. World-class athletes typically perform their best when they are calm, carefree (of the outcome) and focused (on what’s most important). Setting Intentions will help you have a world-class mindset and champion results. If you can consistently set intentions for what’s important to you, you will be able to guide your thoughts and emotions in a way that they will help you do your best! Intentions help you to dream big, take control and focus on the small wins for big results! You got this! 37. 3 Secrets to Pre-Game Rituals That You Need to Know Now! Description: Pre-game rituals are tools that help world-class performers to be calm and focused during situations that are important to them. The great thing is: You don’t have to be an Olympic hopeful to use rituals to help you do your best, especially when you are under pressure and the outcome matters. Here are a few tips, so you can set up a ritual that helps you rise to the occasion: 1. Fuel Up: Do you have a favorite pre-game snack or meal? If there is something that you eat and/or drink in the morning or before an important event that sits well with you and gives you good energy? Try making that part of your pre-game ritual. 2. Look Sharp: Do you have a favorite article of clothing? Maybe something that you feel confident wearing? Maybe a ‘lucky’ article of clothing that you’ve worn previously when you’ve really crushed something? If so, have it ready to go the next time you need to be world-class for something important to you! 3. Get Focused: Think about listening to music, journaling, or anything you can do to be calm and focused before an event. There are plenty of play lists with motivational songs or you can simply take a moment to write down what you know you want to do or what you know you can accomplish. For example, ‘I am confident. I am ready. Let’s go.” You have more in common with world-class athletes than you may think! They get nervous and worried too, but rituals are one way they (and YOU) can get to the business of doing your best, especially when it matters. Description: Being able to manage emotions is a tool that can come in handy during important events at school, at home or in competitive situations. Since emotions drive behavior, this is an important skill to understand and master, so all your hard work can pay off. Once it’s game time, it is time to trust yourself. In other words, trust that your desired result will happen (even if you are not so sure!) World-class athletes perform their best when they are calm, carefree (of the outcome) and focused (on the most important thing to do their best). In other words, they trust and believe in themselves. Not being able to manage emotions is distracting, and the consequences can be significant and frustrating. Keep this formula in mind, and you too will be able to champion your best results: Emotional Control + Trust = Success. Here’s how to get started with managing your emotions, especially when the stakes are high: 1.) Recognize when feeling nervous or doubtful. If you are thinking ‘I am worried about my performance because there is a lot riding on it.’, recognize that ‘worry’, and be at peace with it. You can think ‘I’m worried and that’s ok.’ It’s important to realize that typically emotions need to be felt before they can be moved aside. 2.) Release. Many times, it’s fear that drives negative emotions. We need to pass through fear and get to courage, so we can do our best. One way to do this is to challenge and even welcome your fear, and then commit to doing your best regardless. For example, you have a big presentation coming up, and you are worried about the consequences if you don’t do well.Welcome that worry. Challenge yourself to feel it full force. Then commit to preparing the best way you can. It’s time to slay the worry, not back away from it. 3.) Strategize. You should be in a better place now to get down to what matters! Think of the most important thing for you to do your absolute best. It may be to ask relevant questions, keep eye contact, explicitly ask for what you want at the end of the conversation or breathing a certain way while competing. Whatever it is ... it must be in your control. Elite athletes know how to manage emotions when it matters, and now you can too! Mental Toughness is the tool belt or catalyst which helps you to make consistent progress and to be happy along the way. Please check out the library of (free) resources on my website (www.SherylKline.com) or schedule an appointment with me if you’d like to learn more! Description: We may not be preparing for a NBA title or any national stage, but we do have events that are no less important to us. Maybe it’s educational, professional, or personal. When it’s time to go to battle for something that really matters, there are a couple things you can do to be world-class and deliver. 1.) Get Clarity on What You Want. How do you want to perform, or what outcome do you want? For example, I want to place in the Top 3. Or I want to get a certain job or promotion. Clarity is the first step in going after and getting what’s important to you. 2.) Believe it Will Happen. In other words, ‘Proceed as if success is inevitable.’ You may have to be an actor or an actress because you may not believe what you want is 100% possible. Did For example, if you believe you can place in the top 3 or get that job promotion, you will start to search out ways to get better. It fuels confidence! Your mindset is SO important when it comes to making progress. Rather than ‘fake it until you make it’, you should ‘fake it until you become it’! Here is something that may help. It’s app called ThinkUp that I use and that my clients use. It’s changed my relationships and my business, so I would love for you to check it out. There is a free and a paid version for a nominal fee. Here is the link if you want to check it out, http://apple.co/2rymDk8. 3.) Get Focused on the One Thing. Identify the one thing that’s most important for you to do your best that you have control over. I can’t reiterate enough. When it comes to knocking it out of the park, you need to have control. Anything else is a distraction. For example, if you are in a race, maybe you need to remain calm steady. If you have a big presentation maybe you need to enunciate or keep eye contact. If you are a little nervous or worried, always go back to a deep belly breath or two to clear the slate for what you have control over. Big or small, we all have events in our lives that matter to us. With all the time and effort we spend, we deserve to crush these moments and be happy and proud with our efforts. If you can gain clarity, believe you can, and get laser focused when it’s your turn to shine, you will be on your way to being world-class. Mental Toughness is the tool belt or catalyst which helps you to make consistent progress and to be happy along the way. Please check out the library of (free) resources on my website (www.SherylKline.com) or schedule an appointment with me if you’d like to learn more! Please do share if you found this helpful, and keep your eyes open for "Mental Toughness Mastery" which is my new monthly livecast coming out in the next couple of weeks! I am SO excited to share this with you, and you will be the first to know once it is launched! Description: In 1976, Steve Wozniak suggested to Hewlett Packard (his employer at the time) the idea of creating a personal computer. He was rejected, so he and his friend Steve Jobs got to work themselves on their dream of individual creativity for each user. Martin Luther King had a dream that someday we would all be equal. When Michael Phelps was 7 years old, he had a dream that there were no limits on what he could achieve. Did these world-class performers meet all of the criteria of S.M.A.R.T. goals (specific, measurable, attainable, realistic, timely)? No. They dreamt big and worked every day like that dream was possible, even through massive setbacks and failures. Here are a couple of reasons why YOU should dream big too: 1.) Broad to Narrow: When you dream big, are more optimistic, and shoot for the stars, you are more aware of opportunities that present themselves. This broad awareness may lead you to be more confident and throw your hat into the arena for opportunities that arise. In contrast, a narrow focus, being conservative or unconfident makes it less likely you will try and more likely you will give up if you do try. 2.) The Two Things That Will Happen: ... if you dream big and proceed every day like it is possible. Your dream will come true or you will reach a level of success that would have otherwise never been available to you. It’s been proven over and over that world-class performers achieve their status based on a belief they can do something and consistent and deliberate hard work. What’s important to you? 3.) Role Model the Way: Ever since I was in elementary school (a VERY long time ago!) my dad would tell me that I was smart enough to do whatever I wanted. I just needed to learn how to be resilient. I heard that so often, I believed him, and I’ve found it to be true over and over with myself, my kids and with my clients.! Consider that we believe what we hear repeatedly from those who have influence over us. Especially from a young age. If you can model the way to dream big, others who look up to you will do the same. Is there anything big or small that you dream of doing? Maybe a trip, learning a new language, running a half marathon or even reversing global warming:). Remember the books Peak and Talent is Overrated I recommended from last week? You are only limited by what you think is possible, so start dreaming big! :) Mental Toughness is the tool belt or catalyst which helps you to make consistent progress and to be happy along the way. Please check out the library of (free) resources on my website (www.SherylKline.com) or schedule an appointment with me if you’d like to learn more! Please do share if you found this helpful, and keep your eyes open for "Mental Toughness Mastery" which is my new monthly livecast coming out in the next couple of weeks! I am SO excited to share this with you, and you will be the first to know once it is launched! Description: It is a common misconception that ‘either you have it or you don’t’. In other words, either you are good at math or you are not. You are talented at one sport but not at another. You are a follower and not a leader etc. Here’s something that most people do not know! There is no scientific proof that, even if one excels as a young person, that ‘talent’ is an indicator of whether or not you can become an expert. Sure, if you are 5’2” male, it may be difficult to play basketball at a high level (but not impossible!). All things considered, YOU are capable of much more than you think regardless if you have ‘talent’ or not. There’s one thing you can start doing now that will help you to be world-class in what’s important to you: Deliberate Practice. Anders Ericsson has spent decades researching this very topic and has written an entire book on deliberate practice, Peak. Here are the most important take aways that you can implement now: 1.) Find an Expert: Choose a mentor, a coach, or even YouTube! Find a way to understand the best way to do what you want to do. Ideally, this would be a someone who could watch you, and then make suggestions on how to improve. This can get expensive, so YouTube or some other online (free) learning platform is an alternate option. 2.) Create Mental Representations: Mental what? These are just ‘pictures’ that we hold in our mind. For example, if I say the word ‘cat’, you will likely think of a small, furry, four-legged animal. You have an image in your mind or a mental representation of a cat! Whether you are a swimmer looking to drop time or an engineer trying to develop a code, you will need to know how an expert does what you want to do. Then you will need to create a mental representation of how to do it. 3.) Practice: Practice the mental representations, get input from an expert (or self monitor if need be), make adjustments, repeat. Here’s an example. You swim the 100 free-style, and the most important thing you can do to drop time is to pull more water. Go back to step 1 (grab an expert), create a mental representation of how this expert would pull water, practice, get corrected/make the correction yourself, practice again, repeat. You get the idea. Whether you want to improve in a sport, at work or any other endeavor, deliberate practice is a tool that can help you to take a big step towards that big dream! Here’s to you being amazing! Please do share if you found this helpful, and keep your eyes open for "Mental Toughness Mastery" which is my new monthly livecast coming out in the next couple of weeks! I am SO excited to share this with you, and you will be the first to know once it is launched! Description: World-class athletes are very deliberate in the way they practice and compete. There are a couple things that we can do too to help boost confidence and encourage our best. Here's how: 1). Start with Clearing the Mind: Sounds simple, but not always easy! One way to begin the process is to do a couple ‘box breaths’ before high pressure or competitive events. It’s simply inhaling for 5 seconds through their nose into their diaphragm, extending their stomach, holding for 5 seconds, exhaling for 5 seconds through their mouth, and holding for 5 seconds. So, in for 5, hold 5, out for 5, hold 5. They should be sitting or standing up straight, be comfortable and in alignment. Here's why it works. Research has proven that breathing exercises can change the pH of our blood, change blood pressure, and stimulate the parasympathetic nervous system which is the one that calms us down. This type of breathing also activates the Vagus nerve, which helps to deactivate the stress response, and helps calm us down. You have now cleared the slate for what’s important. 2). Let Go of the Outcome: One thing you can do is to focus less on outcomes and more on preparation and mastery. You have control over preparation and mastery and usually don’t have control of outcomes. In order to have our best shot at doing our best, it’s the process that deserves your attention, not the outcome. Are you what is expected or what you need to do? Are rested for the big day (hopefully most days!)? Do you have a strategy? You need to own whatever important event you are preparing for, not the other way around. Master what you have control over, that’s it. Here's why it’s important. World-class athletes do not worry about what happens if they fail or don’t measure up. If they do, it’s managed effectively and efficiently. The reason being, it’s distracting. In order to do your best, just prepare, clear their mind, assume their desired result will happen, and dismiss any worry of the outcome. HINT: If this is difficult, you should go back to those box breaths. 3). Set Intentions: If you can increase self-efficacy (the belief that you can accomplish something), your confidence should follow. Intentions, things you know you can or will do. For example, “I am fast, and I will run my hardest.” The outcome may not be in your control, but you will start to believe what you tell yourself over and over again which boosts confidence. That gives you your best shot at being as amazing as possible. Here's why it works. Simply, setting Intentions gets you focused on what’s important for you to your best. It’s also an internal accountability system. World-class athletes typically perform their best when they are calm, carefree (of the outcome) and focused. Clearing your mind, letting go of the outcome and then setting an intention will help you have a world-class mindset and champion results. Please do share if you found this helpful, and keep your eyes open for "Mental Toughness Mastery" which is my new monthly livecast coming out in the next couple of weeks! I am SO excited to share this with you, and you will be the first to know once it is launched! 45. 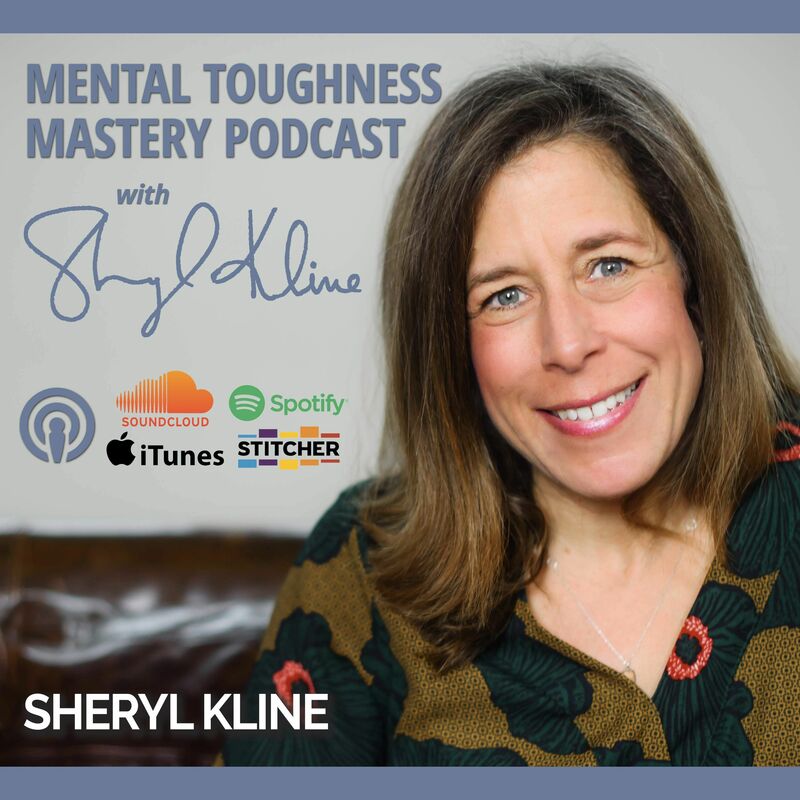 My Story "Why I'm Passionate About Mental Toughness Coaching"
Description: Certified High Performance Coach Sheryl Kline discusses her story and passion for Mental Toughness Coaching. For more information on Mental Toughness, visit www.sherylkline.com to find FREE videos, articles, tools, interviews, testimonials and more. To reach Sheryl Kline for 1:1 coaching, group coaching or speaking/workshop engagements, please email info@sherylkline.com or call (925) 257-4257.